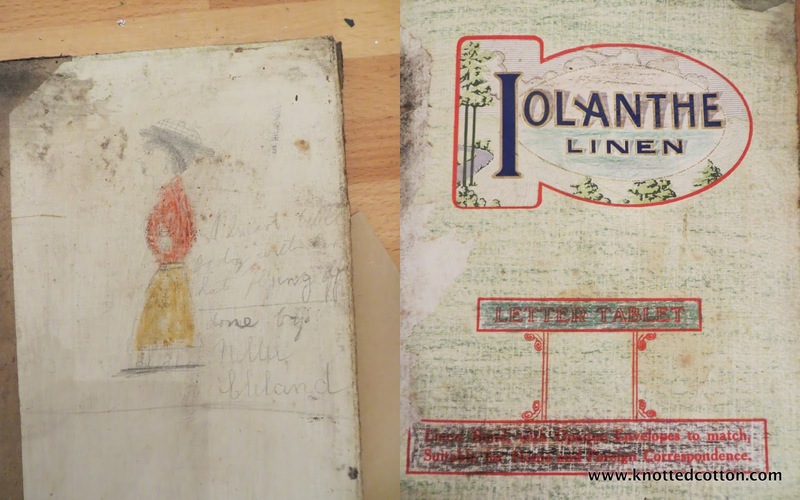 ...hidden behind the thick paper on the walls of my under-stair cupboard, the board of a pad of Iolanthe Linen bond notepaper "Suitable for home and Foreign correspondence", with a drawing on the back. The caption reads "A smart little lady with her hat flying off--------done by Nellie Cleland. I love her button boots. There was a flyer in there too, advising the recipient to buy shares in oil. A bit of research into the date of the flyer suggested that Nellie was probably roughly the same age as my two at the turn of the last century. Dear Nellie, we found your picture. Isn't it fun to think that she hid it for you to find, and amazing that such a "smart little lady" could remain hidden for so long! That's amazing, I love stories like this. I wonder what became of Nellie. You might be able to find out more if you new who lived in the house at the time. What a great story. I love Nellie's signature too. Well wasn't Nellie a mischievous little girl hiding that board behind the wallpaper, what a great find for you though. I wonder if she ever thought that it would be hidden for so long! Ah the treasure to be found in an old house! How exciting! Your walls have stories to tell! This is pretty amazing. WOW! What a treasure!! We renovated our kitchen last year and I was hoping to find something really personal like that (we didn't). This puts a smile on my face. Nellie! I knew walls had ears but I hadn't realised they could tell stories too! Brilliant. What a find! So interesting. Great find! I love the picture. What a lovely find, and a great picture too, she's got real character.